Huawei Honor Holly 3 smartphone is indeed what it is called. The smart device has all it takes to get for personal use. It came with a featured 4G LTE supported network, with a 5.50-inch touchscreen display at 720 pixels by 1280 pixels resolution. It is powered with 1.2GHz octa-core Kirin 620 processor and it comes with 2GB of RAM. 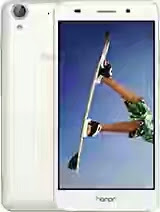 The smartphone called Huawei Honor Holly 3 goes for the price at RS 9,999 in convertion to dollar, it is $149 USD. To see the full specifications for this smartphone, check below.